At least one third of our waking hours are lived on autopilot. But habits of the mind do not have to control us- we can steer them. Drawing on the latest research, psychologist Jeremy Dean explains why seemingly easy habits can prove difficult to form and how to take charge of your brain's routines to make any change stick. 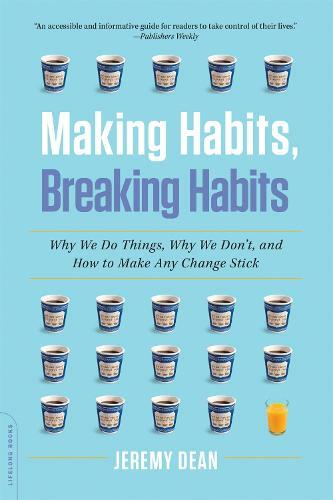 Making Habits, Breaking Habits explains that it is possible to bend habits to your will- and become happier, more creative, and more productive. "Sensible and very readable...By far the most useful of this month's New You offerings." "Making changes does take longer than we may expect--no 30-day, 30-pounds-lighter quick fix--but by following the guidelines laid out by Dean, readers have a decent chance at establishing fulfilling, new patterns." "An accessible and informative guide for readers to take control of their lives." "By helping us understand what makes us tick and why, author Jeremy Dean avoids platitudes and misty advice to give his readers the tools they need to stop being frustrated by change and lack thereof. He advocates patience and dispels a lot of myths about why we do the things we do (or don't), explaining why our willpower fails us or why we find some habits easy to make. That's helpful, and could make a fix that sticks...This book...would be advantageous to anyone who's serious about changing behavior." "Loaded with surprising information about the brain and human behavior, this book that lays out a strategy for taking charge of ourselves. We probably can't beat all our habits forever, but Making Habits, Breaking Habits offers a battle plan that allows us to know the enemy and sometimes evade it." "Dean busts the myths to finally explain why seemingly easy habits, like eating an apple a day, can be surprisingly difficult to form, and how to take charge of your brain's natural 'autopilot' to make any change stick...Witty and intriguing, Making Habits, Breaking Habits shows how behavior is more than just a product of what you think." "[A] fascinating book...Dean demonstrates a knack for cutting through generalities and cutting to the heart of the matter. Making Habits, Breaking Habits will shed new light on your own private and public behavior and the many quests for change that you undertake in your everyday life." "What really stands out in Dean's book...is the insight behind habits and their unconscious nature and often, their benefits...Full of anecdotes and interesting studies, Making Habits, Breaking Habits is an engaging read." "Dean argues convincingly that habits are essentially automatic pilots...The prescriptive part of self-help books is where many of them fall down. Dean's is better than most...The book reads like one in which Dean primarily shares his own fascination with a variety of research projects of various kinds, pausing occasionally to relate this study or that back to the whole issue of forming and changing habits. And there is nothing wrong with being a bit discursive, especially when the underlying material is as interesting as much of it is here." "Analyzes the phenomenon of habits, and breaks them down so they can be fully understood--and ultimately managed." "Dean helps you understand the psychology behind your habits--both good and bad--and gives you the information you need to kick a bad habit and finally keep your New Year's resolution." "This is serious psychology and an often fascinating look at the way habits are formed, reinforced, and strengthened throughout our lives...Smoking, drinking, and comparable bad behaviors can be changed and this book can help anyone seeking to make that change." "Remarkably insightful and functionally helpful in its entirety."